No Scrutiny Please, They’re Saudi. This op-ed appeared in The Ottawa Citizen on October 1, 2015. Accepting the award “on behalf of my colleagues and Prime Minister Stephen Harper,” Kenney sought to reiterate what he, his colleagues, and the prime minister have long portrayed as their unequivocal stance in defending the rights and dignities of those living under the world’s most oppressive regimes. You’d expect, then, after word leaked that Saudi Arabia, a leader in the abuse of human rights, restriction of religious freedom, and repression of women, was selected to head a panel of independent experts on the UN Human Rights Council, that both Kenney and Harper would be among the prominent human rights advocates – including UN Watch – leading the condemnation of the appointment. One could argue the confluence of events coinciding with this incomprehensible decision — allegations of indiscriminate killing of civilians and ethic cleansing of Shiites in the Saudi-led aerial campaign against the Houthi rebels in Yemen; the imminent beading and crucifixion of Ali al-Nimr, nephew of a well-known Shia cleric and prominent critic of the Saud dynasty, arrested as a 17-year-old high school student for taking part in pro-democracy protests — made it incumbent upon Kenney and Harper, both of whom position themselves as global leaders in human rights advocacy, to front the charge in seeking to have the UNHRC appointment rescinded, to call for for an investigation into atrocities in Yemen, to demand clemency for a man condemned to death simply for seeking political reform. Instead, they’ve offered absolute silence on each crucial matter detailed above. That’s not to say the government’s relationship with the Saudis has gone entirely unmentioned in recent days: When questioned about the ethics of his government’s secretive, multi-billion dollar arms deal with Riyadh — secured without the requisite human rights assessments or assurances such weaponry wouldn’t be used against the civilian population — Harper defended Saudi Arabia as a valued ally. He was concerned only, evidently, about possible job losses in Ontario should the deal be axed. A key element of the Conservatives’ re-election bid has been to present themselves as warriors against fundamentalist ideologies and extremist entities. That they’ve deemed a woman who — entirely of her own accord — wears a niqab a greater threat than providing arms to a regime which adheres to and exports the actual medieval ideology which imposes draconian dress codes on women hints at the emptiness beneath the government’s veil of nationalistic rhetoric and international proclamations of moral authority. This was initially meant to be a lengthy Facebook post for those who look to me for information on complex matters (which I do happily, by request). However, it received such appreciation and requests to make it open to all (which I eventually did) that I thought I’d post it here, too, but with additional links/further info for those seeking a one-stop landing for information on the issue. Here’s a round-up of information on the current migrant/refugee crisis, the impossible situation in the Middle East driving it, and what – if anything – can/should be done. The FB page I’ve seen many sharing patently fake anti-Mulsim nonsense from – Britain First – is a NEO-NAZI OPERATION. It’s a white-supermacist organization, full-stop. If you find yourself sharing anything from that page/site – especially when it comes to anything about Muslims or Islam – perhaps you need to re-examine your own values before calling into question the beliefs of others. The same goes for the bigotry emanating from other notoriously-ignorant FB pages – Right Wing News, Chicks On The Right, The Blaze (Glenn Beck’s operation), Fox News, The Rebel, Atlas Shrugged – or the personal pages of disgraced conservative figures like Allen West, Sarah Palin, Pamela Geller, Franklin Graham, Ben Carson, Sean Hannity, Ann Coulter, Ezra Levant, Brian Lilley, etc. There’s nothing wrong with being C/conservative, or holding a C/conservative world view. That’s not who these people are, nor what they represent. All of the above are part of a hateful segment which no respectable person takes seriously. Granted, once in a while a few of those pages might post something innocuous (often one of those feel-good viral memes from other sites). That’s fine. It’s their intentional misinformation and fomenting of hatred that’s the problem. There are reputable C/conservative publications / personalities in existence. These are not them. “Why can’t they just go home”? Because THERE IS NO HOME TO GO TO. Meanwhile, after being shuttled on trains and branded with numbers, refugees are being housed in former concentration camps. Yes, you read that right. Refugees are, in fact, a huge economic and cultural boon to society — not a burden. They are not welfare-seekers. On fears of radicalization – nothing fights radicalization like opportunity. Things to note re: the claims of ISIS infiltrating migrants. Sun News Network: Let The (Incredibly Lazy) Astroturfing Begin! It has been fascinating to watch the Conservative campaign strategy evolve over the past two weeks; working in tandem with Sun TV in a quest to secure a Harper majority, and to destroy the opposition leaders. Aside from the standard issued talking points submitted by the Conservative war room and subsequently written into Sun TV scripts, the Tories are running a co-ordinated effort with their Sun Media counterparts as they try desperately to reach that magical number of 155 seats. “Michael Igantieff wants to be in power, but do we know where he stands? He has flipped and flopped on so many big issues that it’s tough to know. Look at his parliamentary record. Look at where he and his party stands. A quick glance shows that they would bring about a national daycare program to raise your kids for you, and they’d regulate what you can do with your own children by outlawing spanking and any use of force. Any use of force would be illegal. That could include making it illegal for you to strap your two year old, your wiggly two year old, into their car seat against their will … no parent would be allowed to strap their screming kid into a mini van. The Liberlas would also expand ‘harm reduction sites’ from Vancouver to other major cities across Canada. What does that mean? Government sanctioned (drug) shooting galleries in a neighbourhood near you. Note, that the ‘harm reduction site’ Lilley despises so much refers to Insite, Vancouver’s safe injection site which Harper has been fighting to have shut down despite clear, scientific, evidence the program saves lives. You can listen to Lilley, Adler, and Levant discussing this issue, and alternatives to Insite (such as dumping drug addicts in a deserted place – yes that what Lilley actually proposes), BY CLICKING HERE. Enter the weekend, a monumental surge in the polls by Jack Layton and the NDP, and a shift in strategy for week number two (April 25-29), the week of Sun Media’s “Layton caught in Bawdy house!” smear campaign. 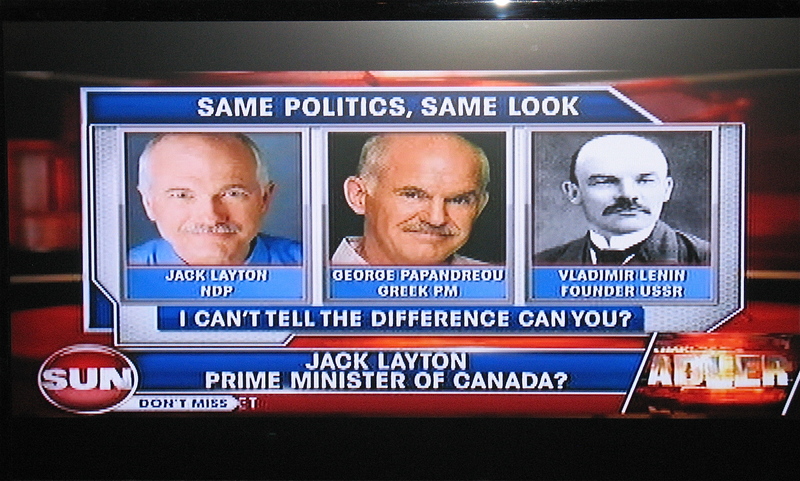 “Jack Layton’s resemblence to Greek Prime Minister George Papandreou – it’s uncanny, both in appearance, and in policy. NDP love for big government has the potential to turn Canada into the next Greece, with a top heave public sector that could break the neck of the economy. This prospect is scaring a lot of citizens of Adler Nation. “Layton doesn’t need 100 (seats) to become Prime Minister. He could do it with fewer than 80. What are the consequences of a coalition led either by the NDP or by the Liberals? David Frum made that clear last night, said that Harper would not govern if he get’s a minority. And the premise is, if Harper doesn’t get the magic 155 seat total, Jack — with the help of Igantieff and Duceppe — Jack could move into 24 Sussex with Olivia. On the morning of April 29, Taylor introduced liberalsforharper.ca to the public for the first time, feigning ignorance of its origin in the process. “A few years back, (Ignatieff) cracked a few standing beside Stephane Dion. There is very little doubt that when the clock strikes 12 on Monday night, the party of Chretien and Trudeau will have struck out, finishing No. 3 for the first time ever. The big question on Tuesday morning will be, how does the Grit family deal with sickly Uncle Grit? On Tuesday morning, Dr. Stephen Harper must scrub up, then go into the operating room. The PM needs to find the right scalpel to save Uncle Grit’s life. If he can find a way to give Michael Ignatieff a shred of dignity, he might be able to prevent Ignatieff from seeking revenge by cutting a deal with Jack Layton, making the NDP leader prime minister. There is a coalition government in Britain today. It was formed by the party that got the most seats with the party that got the third-most. It was formed by the Conservatives and Liberals. Do we still have a British parliamentary system? As Canadians head to the polls in what, by all accounts, promises to be an historic election, it’ll be interesting to see how the partnership bewteen the Conservatives, Sun Media, and the NCC continues to unfold. If Harper fails to get his majority, you can be sure Sun Media will be urging Liberals to ‘do the responsible thing’ and ‘save the country from Layton,’ knowing full well a full merger between the Liberals and the NDP is a very real possibility. And if that happens, the prospect of a Conservative government completely evaporates, not only for the current election cycle, but quite possibly well into the future. In their co-ordinated effort, Teneycke, Levant, and Taylor not only attacked Avaaz.org – a global online advocacy community whose co-founder and Executive Director, Ricken Patel, happens to be Canadian – as a foreign operation, but specifically, and repeatedly, refer to George Soros – a progressive philanthropist who is despised by Right Wing America. By connecting Soros to the Avaaz petition, Lilley, Levant, Taylor, and Tenycke aim to stoke fear in their followers who, more often than not, are avid consumers of extreme Right Wing media such as Fox News, Glenn Beck, Rush Limbaugh, Michael Savage, Ann Coulter, Andrew Breitbart (BigGovernment.com), Pamela Gellar (AtlasShrugs.com), WorldNetDaily.com, and Judi McLeod (Canadafreepress.com). As if on cue, Levant – who spent the summer of 1994 in Washington, D.C., in an internship arranged by the Right Wing Charles G. Koch Foundation Summer Fellow Program – used his Sunday Sun column to import the ‘Soros is scary’ propaganda from his conspiracy theorist counterparts in the U.S. This oft repeated ‘nazi collaborator’ smear is taken from the pages of The Shadow Party: How George Soros, Hillary Clinton, and Sixties Radicals Seized Control of the Democratic Party, a thoroughly discredited book written by right-wing pundits David Horowitz and Richard Poe. Levant’s fictitious claim that Soros “collaborated with the nazis” and “worked for the Judenrat,” is based wholly on unsourced allegations, originating in The Shadow Party, and echoed by Right Wing pundits. “(Soros’ father) hatched a better plan for his son. He bribed a non-Jewish official at the agriculture ministry to let (Soros) live with him. (Soros) helped the official confiscate property from Jews. By collaborating with the Nazis, (Soros) survived the Holocaust. He turned on other Jews to spare himself. How does Soros feel about what he did as a teenager? Has it kept him up at night? Steve Kroft of 60 Minutes asked him that. Was it difficult? ‘Not at all,’ Soros answered. The assertion that Soros confiscated property of other Jews – including the imaginary interview Levant creates by cropping and rearranging portions of the actual 60 Minutes Soros interview – was debunked years ago, when the 60 Minutes interview was first selectively edited by conservative columnist Martin Peretz. Kroft: … by posing as a Christian. Soros: Right. I was 14 years old. And I would say that that’s when my character was made. Soros: That one should think ahead. One should understand that — and anticipate events and when, when one is threatened. It was a tremendous threat of evil. I mean, it was a — a very personal threat of evil. Kroft: I mean, that’s — that sounds like an experience that would send lots of people to the psychiatric couch for many, many years. Was it difficult? Soros: Not, not at all. Not at all. Maybe as a child you don’t … you don’t see the connection. But it was — it created no — no problem at all. Kroft: For example, that, ‘I’m Jewish, and here I am, watching these people go. I could just as easily be these, I should be there.’ None of that? Soros: Well, of course, … I could be on the other side or I could be the one from whom the thing is being taken away. But there was no sense that I shouldn’t be there, because that was — well, actually, in a funny way, it’s just like in the markets — that is I weren’t there — of course, I wasn’t doing it, but somebody else would – would — would be taking it away anyhow. And it was the — whether I was there or not, I was only a spectator, the property was being taken away. So the — I had no role in taking away that property. So I had no sense of guilt. As they say, context is everything. Soros had ‘no feeling of guilt’ because the property was going to be taken whether he was standing by watching, pretending to be the Christian Godson of an employee of Hungary’s Ministry of Agriculture, or whether he was among the Jews apprehended by the Nazis. He did not, himself, take any property, nor did he condone it. He was an adolescent who watched it happen; who was powerless in the face of certain death; who could have done nothing to stop what he witnessed. The remainder of Levant’s article plays out in the same fashion; inaccurate claims, misattributed quotes, baseless allegations. This repulsive attack reveals far more about Levant than it does Soros; Especially given that, in full context, Soros in no way ‘boasts’ about offering to help his mother end her life. In 1994 at the Columbia Presbyterian Medical Center, Soros reflected on the experience of dying and bereavement in America while endorsing the Oregon Death With Dignity Act. Being a global operation, Canadians are able to launch petitions for Canadian interests; Decisions “made in New York?” Not at all. So where exactly does Soros factor into this debate? Despite the repeated assertions of the contrary, Avaaz is not a “front group” for Soros, and by all accounts (excluding the unproven claims saturating conservative websites), Soros is, in no way, involved with this organization. But why let facts get in the way of a good story, eh Levant? After all, it helps draw attention away from reports of last year’s New York lunch date between Prime Minister Harper, Teneycke (driving force behind Sun TV News, who was still Harper’s director of communications at the time), News Corp. (parent company of Fox News) chairman Rupert Murdoch, and Fox News president Roger Ailes. Though they’re (now) claiming not to be a Canadian version of Fox News, the ‘journalism‘ exhibited future Sun TV News host Ezra Levant provides a clear example of what Canadians can expect from Teneycke’s tabloid news organization, post ideological purge. The CRTC wants to hear from the public regarding Sun TV News’ application. Make your voice heard in a single click! You can also weigh in by signing the Avaaz.org petition. First, Kory Teneycke has resigned from Sun Media (QMI) as an RCMP investigation into the spamming of the Avaaz.org petition edges closer to him. (Replacing Teneycke is former Conservative Prime Minister Brian Mulroney’s spokesman, Luc Lavoie — so it’s one Tory insider for another. Second, George Soros is threatening to sue Sun Media (QMI) – which includes Levant. HERE is a snippet of Levant’s twitter attacks on Soros, and HERE is a snippet of Levant’s attacks on me following the publication of this article. On September 5, 2010, a column by Ezra Levant contained false statements about George Soros and his conduct as a young teenager in Nazi-occupied Hungary. Upon receiving a letter of complaint from Mr. Soros’s legal counsel on September 13, 2010, Sun Media Corporation always intended to publish a retraction and apology for this column. Despite constant efforts on both sides, Sun Media and Mr. Soros’s counsel were unable to reach agreement on the content of a retraction. The management of Sun Media wishes to state that there is no basis for the statements in the column and they should not have been made. Sun Media, this newspaper and Ezra Levant retract the statements made in the column and unreservedly apologize to Mr. Soros for the distress and harm this column may have caused to him. In the United States, debate surrounding Arizona’s new harsh immigration policy – the ‘papers please‘ law – moved from arguing the merits, necessity and constitutionality of SB1070, to a nonsensical discussion about the 14th amendment; the part of the constitution which guarantees American citizenship to all persons born in the United States. Republican lawmakers, seemingly unsatisfied with even the most draconian elements of the ‘papers please’ law, felt it necessary to take immigration reform to the extreme, calling for a repeal of the 14th amendment. MADDOW: You might have also heard the one about Phoenix, Arizona, now being the number two kidnapping capital of the world.That‘s become a mainstream conservative talking point trotted out over and over again by Republicans. But when PolitiFact, Texas checked out that claimed when it was made by the lieutenant governor of Texas in June, they found it to be, and I quote, ‘false.’ Nevertheless, Republican Senator John McCain repeated it a few weeks later on Meet the Press. SEN. JOHN MCCAIN (R), ARIZONA: Why is it that Phoenix, Arizona, is the number two kidnapping capital of the world? Does that mean our border is safe? Of course not. MADDOW: Same claim, same results-and I quote, ‘false,’ according to PolitiFact. Despite that, Republican Senator Jon Kyl, undaunted, is still going for it. SEN. JON KYL (R), ARIZONA: Phoenix is a very large source of kidnapping. It‘s called the kidnapping capital of the United States. MADDOW: It‘s like it‘s too good of a talking point to stop using it even though it‘s not true. Jon Kyl also distinguished himself by going to great detail about how awful illegal immigration has made crime in his home state of Arizona-a state you would think he would take care to know some factual things about. HARRY SMITH, CBS NEWS: In some of these border towns that were thought to be susceptible to lawbreaking of illegal immigrants, the crime is actually down. Crime in Phoenix, for instance, is down significantly over the last couple of years. KYL: Well, that‘s a-that‘s a gross generalization. Property crimes are up. Certain property crimes on certain parts of the citizenry are up. MADDOW: Property crimes are up, violent crimes are up-define up, Senator Kyl. Let‘s take property crimes first. There were about 231,000 property crimes in the state of Arizona last year, in 2009. That was down from the year before, which had about 262,000 property crimes-a number that was down from the year before that, which was down from the year before that. Property crimes there, down in Arizona right now. Senator Kyl also mentioned violent crimes being up. Let‘s have a look at what he thinks about up in this context. In 2009, there were 26,000 violent crime offenses in Arizona, a number down from the year before, which was also down from the year before that, which happened to be down from the year before that. So, down, down, down, down, down-also known in anti-immigrant white people politics as up. MCCAIN: The United States of America has an unsecured border between Arizona and Mexico which has led to violence, the worst I have ever seen, and numbers that stagger those who are unfamiliar with the issues. MADDOW: Yes, they are staggering numbers-for the exact opposite reason of what you mean.Whether or not you want to run on an anti-immigrant platform is up to you. It‘s a political decision. Everyone gets to choose their own political strategy. But as they say, you do not get to choose your own facts. The common thread linking the various Republican arguments for repealing the 14th amendment is fear – fear of non-white citizens; fear of men, women, and even children, who ‘don’t look like you.‘ To justify their deeply held anti-immigration ideology, Republicans are presenting misinformation as fact, disseminating fear as a means to a legislative end. Canada, for the most part, has been immune to such radical immigration demagoguery, as we are a nation built on immigration; from the Europeans who first explored in the 15th century, to the estimated 1.5 million displaced persons, war brides, evacuated children, and refugees who passed through Pier 21 – the gateway to Canada – between the years of 1928 and 1971. Canada’s history of immigration is so cherished, the stories of migrants so important, that on June 25, 2009, Prime Minister Stephen Harper designated Pier 21 as a National Museum of Immigration. The harrowing voyage of the MV Sun Sea, in which 492 Tamil refugees endured months of squalor in dangerous waters to escape “mass murders, disappearances and extortion” following 25 years of brutal civil war in Sri Lanka, mirrors the experience of so many migrants who passed through Pier 21. However, unlike Pier 21, there were no counsellors waiting to hear the Sri Lankan’s stories; no team of volunteers eager to swiftly process and fairly evaluate the prospective new residents. Instead, the men, women and children aboard the MV Sun Sea arrived to allegations, leveled by the Harper government, of ties to terrorism and human trafficking; accused by Public Safety Minister Vic Toews of being a “test boat” for an apparent mass immigration conspiracy. “Canadians are pretty concerned when a whole boat of people comes – not through any normal application process, not through any normal arrival channel – and just simply lands. Instead, he seems to have adopted the Republican ‘immigrants are scary’ mantra; using the MV Sun Sea as a political prop in an effort to appear ‘tough on immigration.’ Furthermore, like his ideological equals to the South, Harper has proposed changing existing legislation to suit his ideology; specifically the 1985 Supreme Court Ruling which guarantees constitutional charter rights to refugee claimants in Canada. The Conservatives’ anti-immigration demagoguery has been amplified by Sun Media (QMI), the organization known as Fox News North, now headed by Harper’s former director of communications Kory Teneycke. Sun Media (QMI) has fervently tried to vilify, discredit, and slander the Sri Lankan migrants, even going so far as to incite violence against future refugees. The xenophobia propagated by both the Harper government and their colleagues in the press is disgraceful to who we are as a nation. It is an insult to our parents, grandparents, and great grandparents who went to great lengths to journey here; who are among the proudest residents to call Canada home. To discredit those who seek refuge within Canadian borders, fleeing circumstances such as war, poverty, oppression, and corruption, before they have a chance to present their case, does a great disservice to the generations of migrant Canadians on which the Country was built. Those who’ve attacked the migrants aboard the MV Sun Sea would be wise to listen to the stories of past immigrants, for “too many people in Canada forget that people crawl across minefields to get here.” ~ Ignat Kaneff, Bulgarian born Great Canadian. This is the ‘General cc Ballou’, the ship that carried my Polish grandparents to Pier 21 from a camp in Germany following the Second World War. I encourage you to read the personal accounts of those who came to Canada through Pier 21 HERE. It’s a proud part of our history. “I have always honoured my oath and responsibilities as a public servant as well as those specific to the Statistics Act. I want to take this opportunity to comment on a technical statistical issue which has become the subject of media discussion. This relates to the question of whether a voluntary survey can become a substitute for a mandatory census. Clement’s false assertion that he had the support of Statistics Canada is one of the many flawed arguments put forward by the Harper government in efforts to garner support for the unpopular, and purely ideological, policy decision. So, were Canadians really up in arms over the census in the past? Not according to the Canada’s privacy watchdog, whose office received a grand total of THREE complaints regarding the census over the course of the last decade. Furthermore, a comprehensive study undertaken by Statistics Canada following the 2006 census fails to substantiate the government’s claim of widespread privacy concerns from citizens. The 53 page StatsCan report, which garnered over 1,200 responses from “government agencies, municipalities, non-profits, community groups, academics, private businesses and ordinary citizens,” makes no mention of Canadians finding the census intrusive or overly burdensome. Regarding the reliability and accuracy of information gathered through a voluntary questionnaire, one only has to look to our neighbours to the south, who in 2003 experimented with a voluntary survey in place of a mandatory census. What resulted was an expensive mess of skewed and degraded data, prompting an about face on the very idea of a voluntary form. Thus is the crux of the matter: The ill-advised move on the census is based not on tangible arguments nor on substantiated data, but on a shrewd political calculation made to play to the Conservative’s ideological base. Notice the champions of doing away with the long form census are Right Wing ideologues who read from a single script of talking points; Who share in a fundamental lack of understanding surrounding the importance of the long form census, and who exhibit a callous disregard for the people who’d be impacted the most. Indeed, ignoring evidence while crafting policy has become a recurring theme for this government; One who’d rather build talking points to support their desired legislation, than build legislation based on indisputable, real world, information. Further reading: A breakdown of how the long form census information is used, and a breakdown of the consequences of ending the mandatory long form census. Fifty miles off the coast of Louisiana, upwards of 100,000 barrels per day of oil are gushing from BP’s Deepwater Horizon well into the Gulf of Mexico. With the equivalent of one Exxon-Valdez seeping into the Gulf every three days, mass devastation of the wetlands, wildlife, and marshes surrounding the area is a forgone conclusion. Those who make a living in fishing industry, often through family businesses inherited from generations past, can only watch as their entire way of life is slowly consumed by the crude. Among the “outright inanities” found in the farcical plan is the inclusion of “sea lions, seals, sea otters (and) walruses” as “sensitive biological resources” in the Gulf, listing a Japanese home shopping website as a “primary equipment provider for BP in the Gulf of Mexico Region (for) rapid deployment of spill response resources,” and forbidding company spokespeople of promising “that property, ecology, or anything else will be restored to normal.” Perhaps the most egregious example of BP’s utter ineptitude at disaster response readiness lies in the contact referenced to monitor the impact oil would have on local marine and wildlife. Listed as the emergency contact is Dr. Peter Lutz, former biologist and university professor. The problem? Dr. Lutz died of pancreatic cancer in 2005. The disaster in the Gulf can be traced back to the Bush/Cheney administration, and is a direct result of the incestuous relationship between Republican lawmakers and the oil industry. Between the years 2001 – 2008, the Bush White House cut funding to clean energy research and development, provided multiple tax breaks and subsidies to the Oil and Gas industry, approved drilling along coastal strip of the Arctic National Wildlife Refuge (ANWR), and lifted the decades old moratorium – put in place by George H.W. Bush – on offshore oil drilling. But by far, the single most destructive element of the Bush/Cheney energy platform was in allowing the industry to self-regulate. The fallout of these industry-friendly policies can be seen throughout the Gulf region; toxic subsea plumes comprised of oil and chemical dispersants; marshes, wetlands and wildlife saturated in heavy crude; pristine beaches spotted by a repeated deluge of tarballs. As days turn into weeks, and weeks into months, the sense of helplessness felt by those directly effected by the spill has now engulfed an entire nation; All the while, the oil continues to flow, unabated, into the Gulf of Mexico. Ironically, as North American attention is focused primarily on the crisis in the Gulf, drilling quietly began on an even deeper well some 430 km off the coast of Newfoundland and Labrador. Located in the Orphan Basin, Chevron’s Lona 0-55 exploration well is being drilled in 2600 meters (8530 ft) of water; nearly twice the depth of BP’s 1500 meter (5000 ft) deep Deepwater Horizon well. Because this class of ultra deep exploration poses a substantially greater risk than did the BP rig, one would assume greater precautionary measures and safety procedures would be required to gain approval to drill such a well. Such an assumption, however, would be incorrect. The long standing rules governing offshore drilling in Canada were once rigorous, requiring oil companies to install specific safety equipment, such as certain types of blowout preventers and safety valves. So detailed were the regulations, they directed a wide range of procedures, from how companies were to carry out the cementing process, to how they should conduct pressure tests. Thorough environmental assessments were made by the federal government, and were mandatory prior to awarding a drilling contract. But much like the Bush/Cheney administration, Prime Minister Stephen Harper and his Conservative colleagues have implemented industry friendly policies, gutting environmental oversight, and handing over regulatory duties to the industry friendly boards. Under policy changes that came into effect late 2009, deep well operators are asked to “set environmental-protection goals, list the equipment they will use to achieve those goals and disclose their plans for inspecting, testing and maintaining such gear;” Governmental inspection and specific safety equipment installation is no longer required. Another component of Harper’s watered down legislation deals specifically with emergency response plans; particularly the requirement of relief wells. Prior to the 2009 regulatory changes, Oil companies were mandated to present a detailed list of contingency plans as well as identify a specific rig to drill a relief well. Required information about the stand-by rig included its “operating capability, its location, contractual commitments, state of readiness and the schedule for mobilization to the well site.” Now, as a result of Harper’s regulatory revisions, the requirement for thorough, detailed relief well plans no longer exists. Because Chevron is drilling at record depths, reaching farther into the deep than has ever before been attempted, the policy changes enacted by the Harper government are a grave cause for concern. But beyond the weakened set of rules governing the oil industry are specific questions surrounding Chevron, and the federal-provincial agency – the Canada-Newfoundland and Labrador Offshore Petroleum Board (C-NLOPB) – who approved, and is regulating, the Lona 0-55 well. Like the NEB, who’s industry insider members include a member of the Canadian Petroleum Hall of fame, the C-NLOPB has come under fire for it’s close ties to the Oil and Gas sector. C-NLOPB chairman and CEO Max Ruelokke is a veteran of the offshore oil industry, and at the time of his 2005 appointment to the C-NLOPB he was general manager of AMEC Oil and Gas. Location – Gulf of Mexico and Louisiana, US. The assurances of the safety of the Lona 0-55 rig, including Ruelokke’s claim “we would never allow (a disaster like is happening in the Gulf) to happen. Our policy, procedures, training, equipment are such that it will not happen,” are simply not supported by the facts. Subsequent to the grilling of the five major oil companies (Chevron included) by Washington lawmakers, it became apparent that BP’s ineffective, error riddled emergency plan was identical to the plans of the other four oil companies; identical in that they were literal photo-copies of one another, bound behind different company logos. In essence, the flawed contingency plan BP had in place at the time of the blowout is the same flawed contingency plan currently in place by Chevron; Even as it drills the world’s deepest offshore oil well. For a province that boasts how “few fishing destinations in the world rival Newfoundland and Labrador,” the grave impact on the fishing industry in the event of a spill has yet to resonate with Premier Williams. The staggering cost of the clean up effort, given Chevron’s admitted inability to handle a blow out, would also leave taxpayers on the hook for the vast majority of the clean up effort. In Canada, oil companies are only liable for up to $40 million – that’s $35 million less than the U.S. liability cap of $75 million. The parallels between BP’s Deepwater Horizon well and the risky game being played off the coast of Newfoundland and Labrador are worrisome. Though the oil industry boasts advancements in drilling technology and the ability to explore in ever deeper waters, there has been little progress made toward making drilling safer. The consequences of failing to invest in safety technology for drilling are clearly laid out in a report by MSNBC’s Rachel Maddow. In comparing techniques currently being used to try and stem the leak in the Gulf to the techniques employed 31 years ago in a similar well blow out, Maddow uncovers the failure of the oil industry to match advancements in drilling safety with advancements in drilling capabilities. Now with Chevron drilling in 8,530 feet of water, the chance these failed maneuvers would effectively stop a leak at even greater depths is virtually non-existant. The Lona 0-55 well off the coast of Newfoundland and Labrador carries with it a higher degree of risk than did either the Ixtoc or Deepwater Horizon wells; Still, the tested, effective response measures necessary to mitigate those risks has yet to be developed. With Oil companies raking in profits of billions of dollars every year, there is no excuse for the failure to invest in drilling safety technology. Furthermore, the catastrophic impacts resulting from weakened regulatory policies should serve as a lesson to all who wish to move beyond dependence on foreign oil. North America cannot drill its way to energy independence, nor can it rely on scant offshore oil reserves as a stable source of energy. The only way to achieve energy independence is through advancements in renewable energy technology. While the need for fossil fuels will remain well into the future, we can limit our dependance on oil through innovation, investment and a clean energy strategy. In order to prevent another Deepwater Horizon disaster, strict regulatory policies must be put in place. No further drilling contracts should be awarded until adequate safety technology is developed, and demonstrated to work, at the depths oil companies wish to drill. Tax breaks and subsidies to the industry also need to end; The money, in turn, invested in clean and renewable sources. If we hope to make real advancements toward a clean energy future, bold action is required from both government and citizens alike. Time and again, world leaders have proclaimed the need and the desire to break the oil addiction. Unfortunately, the tangible action necessary to achieve this lofty goal have been few and far between. Desire, intention, and imagination can only take society so far; Now, a firm commitment and a clear course of action are what’s required to attain a future without a dependance on fossil fuels. Minister Prentice would like to correct a statement in the article entitled “Chevron – because BP wasn’t drilling deep enough” by Alheli Picazo which appeared on June 21, 2010. With the proposed changes to the Canadian Environmental Assessment Act, the Minister of the Environment would not have the authority to cancel an environmental assessment as stated in the article. The changes would provide the Minister of the Environment with new authority to focus an environmental assessment on key components of a project, if appropriate. The discretion is intended to provide legal certainty and to ensure that resources and efforts are invested where it matters the most. While Mr. Prentice may not like what I’ve written, my reporting on his powers to allow projects to go essentially without a thorough environmental assessment is accurate. 15.1 (1) Despite section 15, the Minister may, if the conditions that the Minister establishes are met, determine that the scope of the project in relation to which an environmental assessment is to be conducted is limited to one or more components of that project.